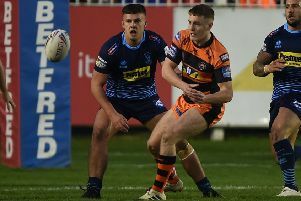 Various different combinations have been tried so far this season with Tuoyo Egodo the latest to be handed the right centre spot made vacant by the departure of Jake Webster. Mike McMeeken, back in the Castleford Tigers squad for the trip to Huddersfield. The youngster carried the ball strongly to give the Wigan defence some problems last Friday and scored a crucial try, but also struggled in defence up against in-form England centre Oliver Gildart in the first half. Greg Minikin, Alex Foster and Ben Roberts previously occupied the right centre position with mixed success and it has prompted the Tigers to publicly admit they are looking to bring in another outside back. With no immediate prospect of a deal being done before the trip to the John Smith’s Stadium, Powell has to find the right combination on the right edge with what he has to choose from and he is hoping the return from injury of Mike McMeeken will help. He explained: “Clearly our right edge has been under a fair bit of pressure the last few weeks. “They came up against (Konrad) Hurrell and didn’t handle that too well, then (Oliver) Gildart caused us some trouble last week. We have got some areas to fix up for certain. “There’s a few things that have happened that’s not helped. We lost Mike McMeeken and he’s an embedded right back-rower for us. Then we lost a half -back (Luke Gale) and then lost another half-back (Jamie Ellis) – and another half (Jordan Rankin)! Powell is hoping to have McMeeken back this week after his hamstring injury and he has been included in the 19-man squad along with fit again forward Junior Moors and recent signing Daniel Smith. But he is keeping his options open for who gets the nod at centre. He said: “I’ve got to make a decision in the centre. It has been like that for a few weeks now and we’ve just got to find the right combination that works for us over there. 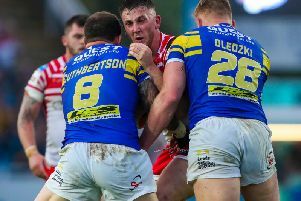 “It’s as difficult place a rugby league field when things aren’t going your way and the opposition are getting over the top of you. But I thought we got better in the second half against Wigan and handled that threat much better. “Alex Foster is obviously an option at centre, but I don’t think he will be available. He’s got a bit of a knee injury that’s not major, but is hanging about and his season so far has been pretty stop-start. He hasn’t really got into a groove.